As Halloween fast approaches, now is the time to stock up on everything you need to celebrate this spooky event. It is the one time of the year that both adults and children get to dress up, eat candy and enjoy a little spooky fun. Morph Costumes is one of the leading suppliers of Halloween fancy dress outfits. If you’re a gadget lover you will be interested to know that there are plenty of gruesome, impressive Halloween themed gadgets available on the market. When searching for Halloween gadgets, Digital Dudz is one of the main brands to focus on. They offer some of the most advanced, high tech gadgets on the market. The company has a particularly impressive Halloween t-shirt collection. 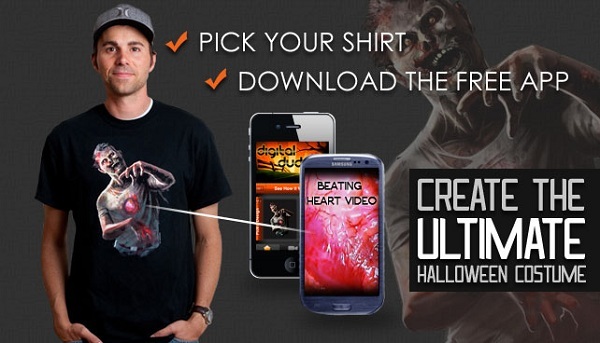 The ‘Frantically Moving Eyeball’ and ‘Beating Heart Zombie’ t-shirts are extremely realistic. Featuring realistic animations, these t-shirts are sure to provide quite a few scares! These are some of the first t-shirts to feature wearable technology. You will need to download an app on your smartphone, place the phone in your pocket and then place a shirt over to get the full effects of the beating heart flesh wound skin suit. Other t-shirts in the collection can be worn alone, though you still need your phone to activate them. Digital Dudz has a great range of costumes and most feature animations. Take a look at the full collection today. Ok, so you won’t actually be re-enacting the famous gruesome shower scene, but you’ll certainly feel like you are! As featured by NBC News, the electronic serial killer shower curtain is a unique, spooky addition to your morning shower! Scare your friends and family by fitting the curtain on Halloween morning. As they shower they will hear the Psycho theme music along with horrific screams. It works by detecting motion and sound so the more noise you make, the longer the terror will continue. If money isn’t an issue, the axe killer animatronic prop is an excellent gadget to invest in. Seen on THEFW website, this impressive animated screen features a real-life looking axe wielding maniac trying to smash through the glass. Place it on your front door to scare any visitors. Beware that this may prove a little too terrifying for young children! You don’t need to have a lot of money to enjoy spooky gadgets this Halloween. There are plenty of smaller gadgets that have a similar spooky effect. The haunted toilet roller is a good example. Simply place it on your toilet roll holder and tell people your bathroom is haunted. As they grab the toilet paper screaming, howling and moaning sounds will be released. This is definitely going to cause quite a few shocks! As you can see, there are plenty of gadgets available to add an extra spooky quality to the home. No matter what your budget, there is always something you can afford to make your Halloween more memorable and fun.